In the recent years, tent cards have emerged as the most innovative medium of advertisement. These cards can be seen mostly in coffee houses, restaurants, dining places, food courts. The main aim of these cards is to grab the attention of the potential customer. The information along with pictures is displayed on the slanting sides. The fonts are big, texts are evenly placed so that it can get noticed in the first glance. 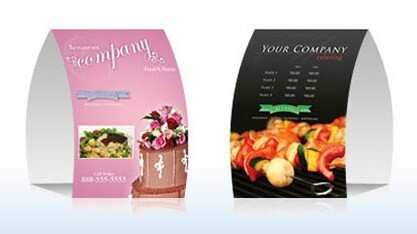 They are efficient business marketing tool, printed on good quality heavy papers. Their appearance is generally like a tent or triangle. The shape helps them to be easily placed on the table. The other prominent advantage of the cards is that they are affordable and are perfect for targeting specific customers. Small Tent Cards size 2" x 3-1/2"
Large Embossed Tent Cards 3-1/2" x 11"
Tent Cards Printing is Easy! Table tents put your ads right in front of your customers. They are commonly used in restaurants, bars ,nightclubs and hotels. Some companies use table tents at conferences and trade shows to display information. Table tents are usually customized as per the size of advertising area . With use of vibrant colors and bold graphics on the table tents ,one can easily grab attention of the visitors .The table tent should be designed in a away the information contained is easily visible for a distance as well. Thus ,table tents are an excellent way of marketing to up sell products and services and instantly boost them. Size : Choose an Option... 4.25" X 6" Verticle 5" X 7" Horizontal 8.5" X 11"